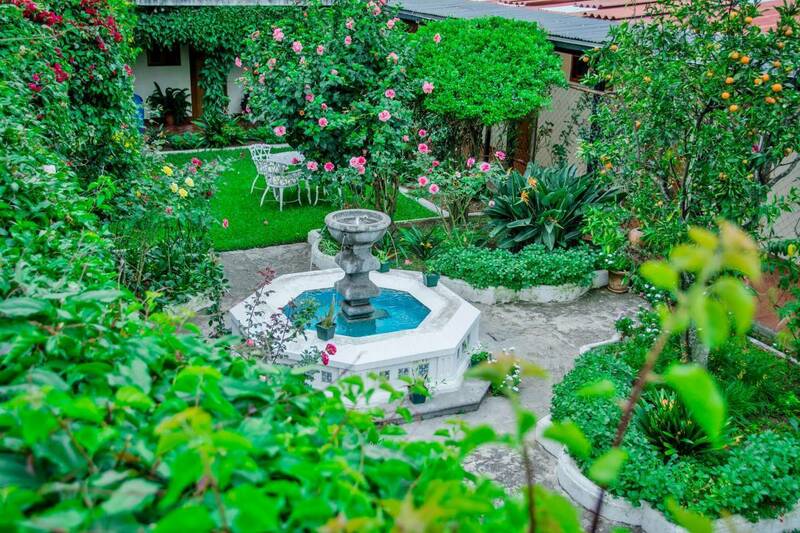 We are a beautiful mid range hotel close to the central park in Antigua Guatemala. In our Hotel you are not just another guest, but you are our friend. We have 25 years of experience. Our prices are competitive. We are just three blocks from the central park, close, but just far enough away to enjoy the peace and tranquility of Antigua. We provide information and attention on a personal basis. 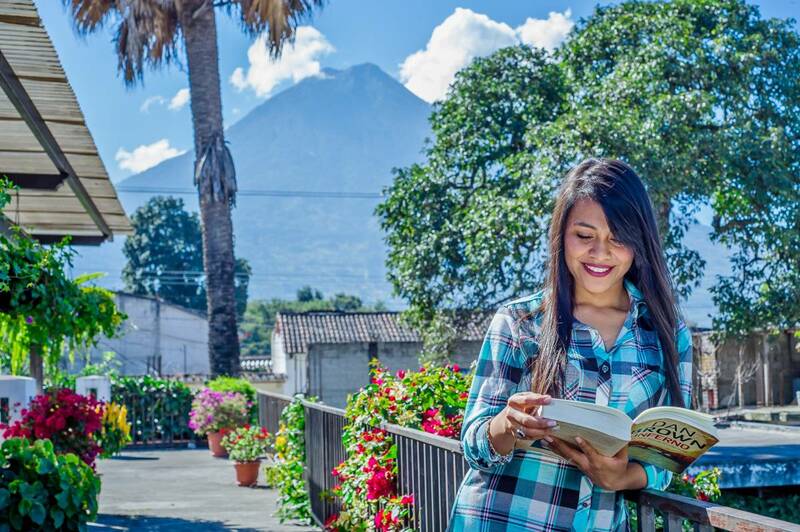 Our staff is friendly and helpful and our resident parrot Paco is always on hand to offer you a welcoming, “hola.” The hotel is decorated with local art, woodcarvings and the colorful textiles that help make Guatemala so vibrant and unique. All rooms are on the ground floor and are equipped with modern amenities. Open your window and enjoy a fresh breeze from the colorful tropical garden. For a little added comfort, ask for one of the rooms with a fireplace and a bathtub. Guests who arrive by car will be happy to find there is a secure parking lot adjacent to the hotel. Our rooms and grounds reflect the colonial history on Antigua. The hotel is even better now, as we just completely remodeled the hotel in July 2017. We offer 26 very comfortable & clean rooms. All with beautiful Guatemalan typical furniture & fabrics. All rooms have cable TV, Wi-Fi & new anti-stress beds. We have different options for each need, all of them to make your stay pleasant and comfortable. If you are coming with little ones, we have a family friendly environment in our hotel with lots of garden space to play. There is a real friendly atmosphere and a since of being at home here. With many common areas in the hotels, you have the opportunity to meet many different & interesting people. Throughout the hotel you can enjoy comfortable places to rest. Serve yourself a drink from the courtesy coffee station, and choose a place to relax. Sit by the fountain in the beautiful garden and listen to the songbirds as they flitter between the rose and hibiscus bushes. Or go upstairs to the rooftop terrace where you can settle into a lounge chair for a siesta while basking in the Central American sun, or sit under the awning and enjoy a spectacular sunset with views of the three volcanoes that surround the Panchoy Valley. The rooftop pergola can also be reserved for special events and conventions. 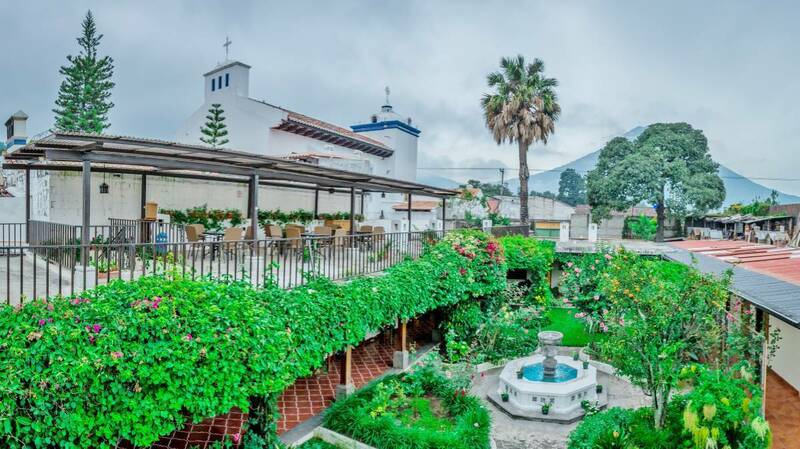 In our properties group we offer 11 hotels and 2 sets of vacation rental apartments: Three 4-star hotels (1 with suites, 1 with a swimming pool and spa, and 1 set in the colonial ruins of a historical convent), two 3. 5-star hotels, three 3-star hotels, three 2. 5-star hotels. All of our hotels are within 4 blocks of each other and within 3 blocks of Antigua's beautiful central park. We have over 225 rooms and can accommodate up to 750 people. So, we can accommodate large groups in one single hotel or very large groups between a few of our hotels. Even if your group is split between a few of our hotels, you would never be more than a 3 minute walk from the rest of your group, since our hotels are very close to each other and very centrally located to the central park of Antigua. Also, if your group is interested in meal plans, we can provide breakfast, lunch and dinner. In Hotel San Jorge, we can offer single, double, triple or quad rooms with private bathrooms. We offer all private & comfortable rooms, 26 rooms in all. We offer single, double, triple or quad rooms, with private bath & cable TV. All our rooms have frontal views of our beautiful gardens. For even better views of Antigua and our surrounding volcanoes, go up to the huge 2nd story terrace. 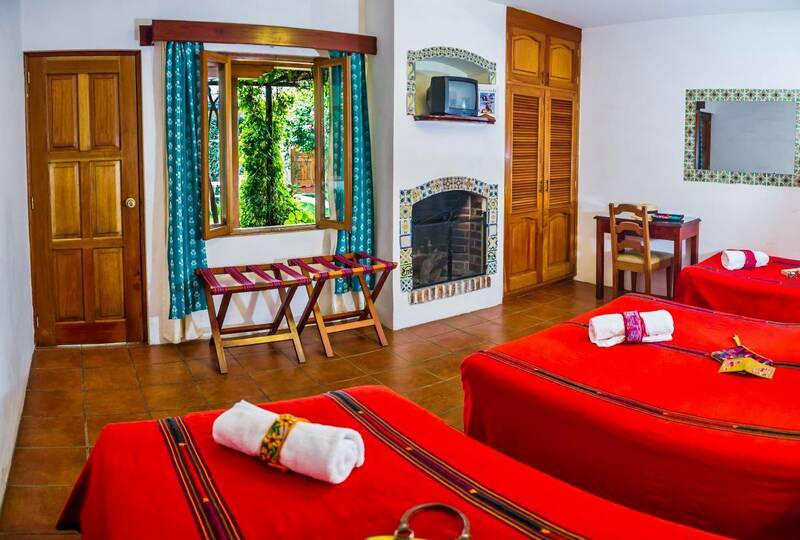 All rooms are private with comfy beds (all anti-stress matresses), lots of bright Guatemalan colors & lots of light. All rooms have closets for hanging your clothing. All have hand made writing desk & chairs, night stands, head boards, iron forged lamps & windows with lots of natural light. The hotel is located close to all the important sites, 3 blocks from the central park. With in 3 minute walk, there are historical sites, restaurants & shopping. Breakfast is offered for $6 extra. If you are planning your own way, from Guatemala City airport, take a shuttle or drive to Antigua (45 minutes) via Calzada Roosevelt. Enter into Antigua via 3rd Calle, for Hotel San Jorge, turn left on 4th Ave, go 2 blocks south, past the central park to 4th Ave south #13. We offer private airport pickup for $37. This price is for 1 to 3 hotel guest. For larger groups, it is $8 extra per person. To arrange this, please write us an email at hotelsanjorge@hotmail.